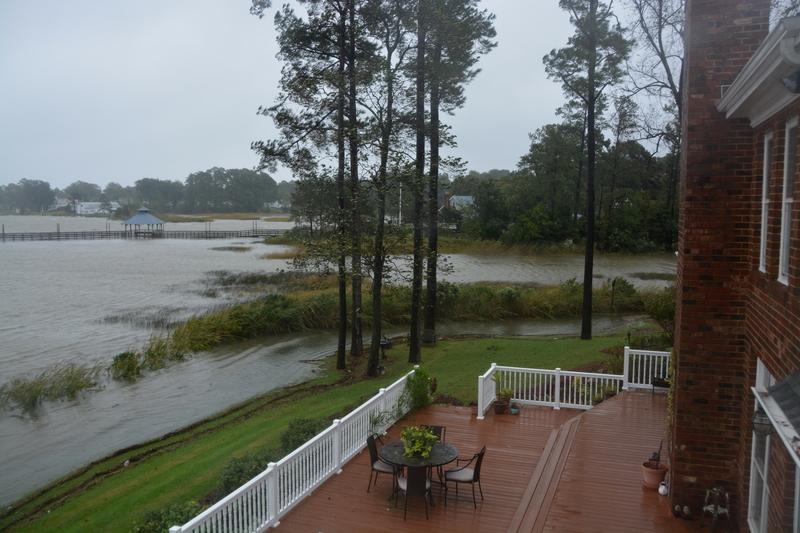 To begin this post, let me say that the tidal flooding we had in our yard this week was what meteorologists refer to as “nuisance flooding”. Yesterday, Motor Man and I listened online for several hours to emergency services frequencies in Columbia, South Carolina. A firefighter was swept away by flood waters and clung to a tree for nearly two hours before he was rescued. A Blackhawk helicopter was brought in to rescue residents from their homes, because the streets were impassable. So, what we experienced in the way of flooding was nothing. Some of those folks have lost all their belongings and their homes, and quite possibly, family members or neighbors. The only inconvenience to us is what we’ll pay to have all this tide debris removed from our yard. But, it does make for interesting photos. I’ve attempted to find some before shots to give you a comparison. 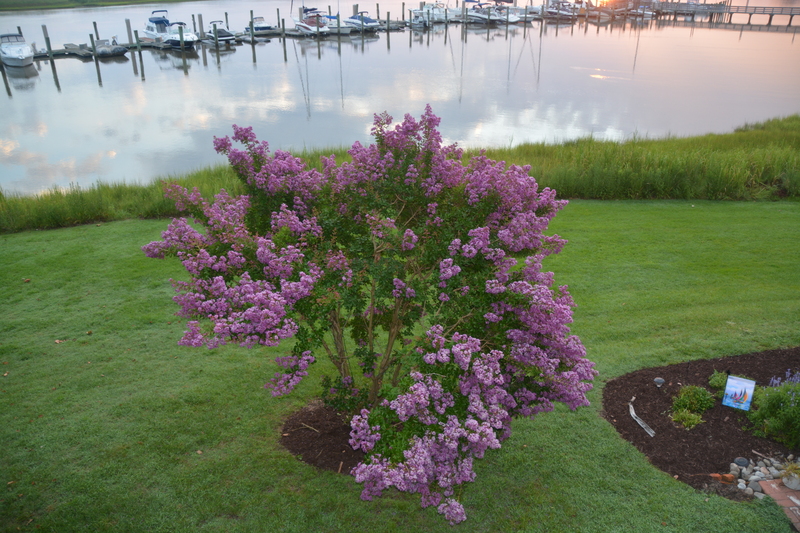 This photo (taken from our balcony on a normal day) is of a crape myrtle tree just outside our kitchen window. 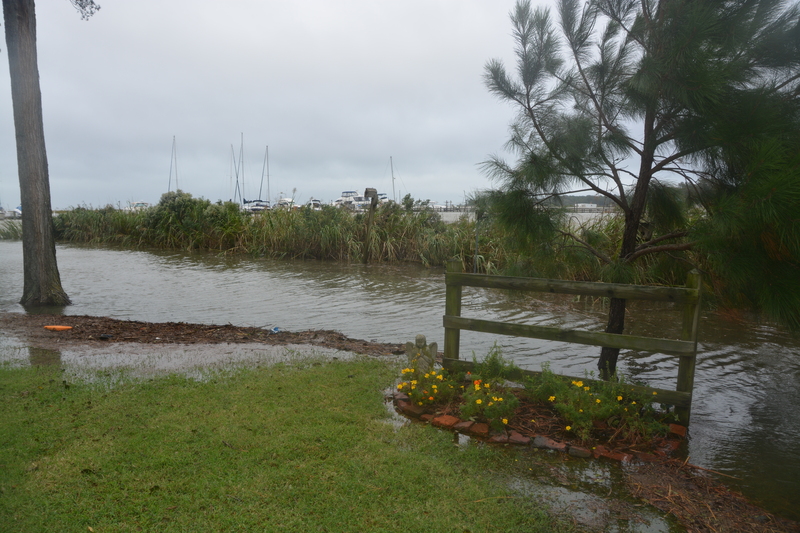 This is the breakwater at the marina in front of our house – again, taken on a normal day. And yesterday – at high tide. 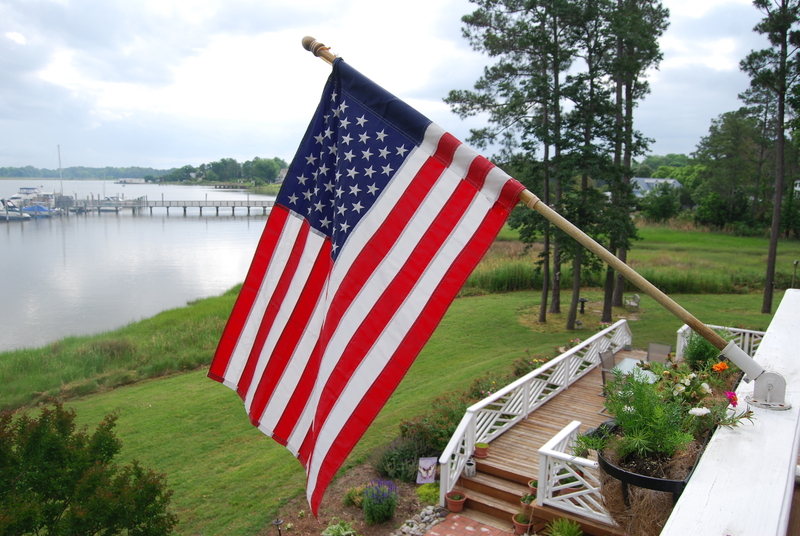 A picture taken from our balcony a couple of years ago. 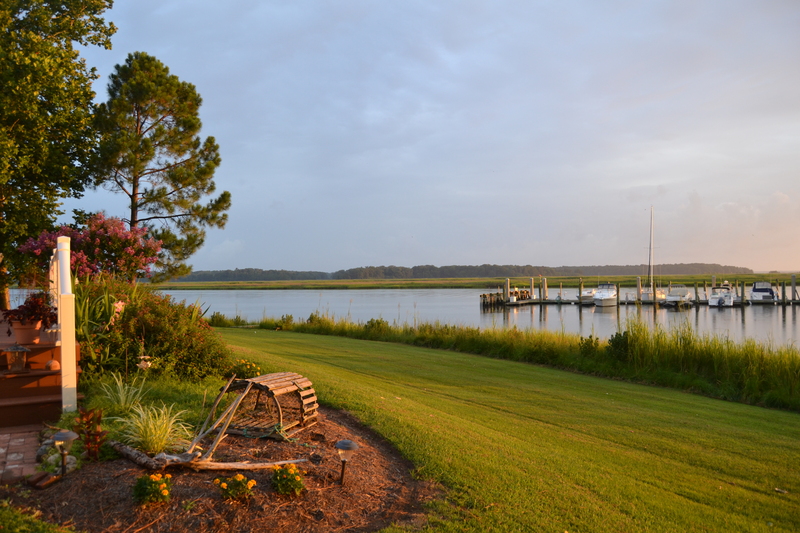 This photo shows the “other” side of our yard from where I take pictures of the sunsets and the old boat. 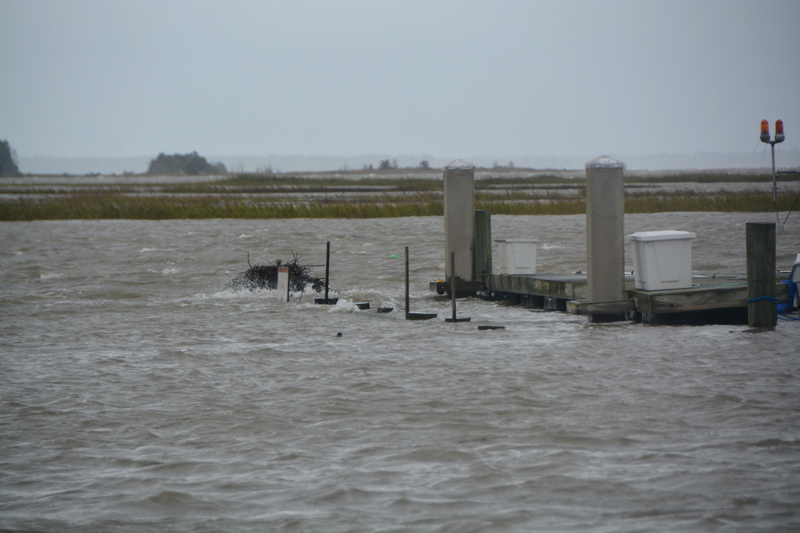 (By the way, the old boat is fine: the tide wasn’t high enough to affect her.) 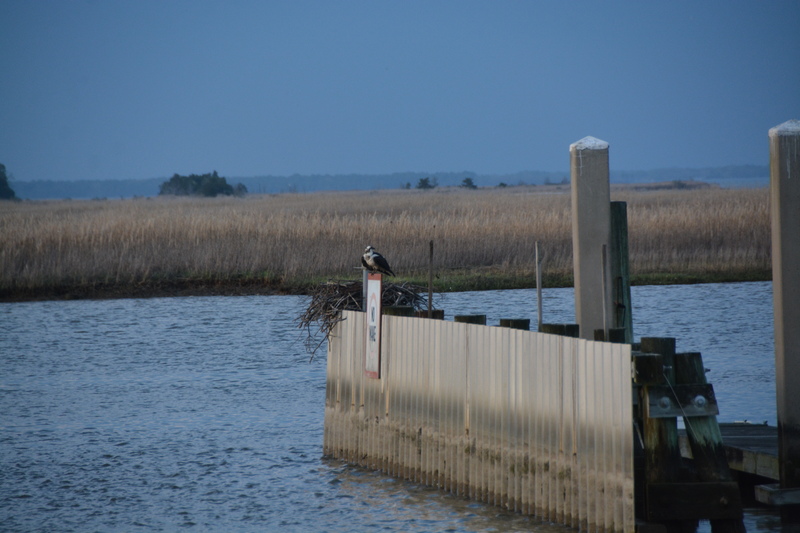 In the background is a little inlet, which is normally marsh and not filled with water. 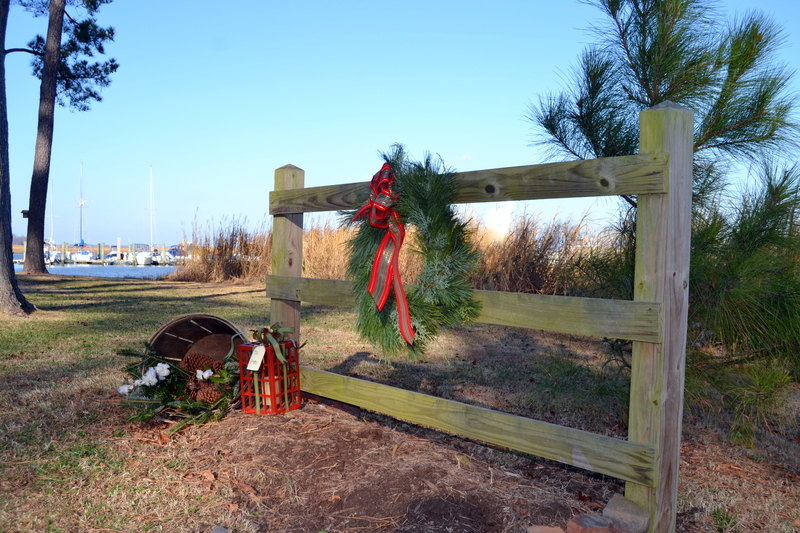 An old picture of the little fence in that area, decorated for Christmas . 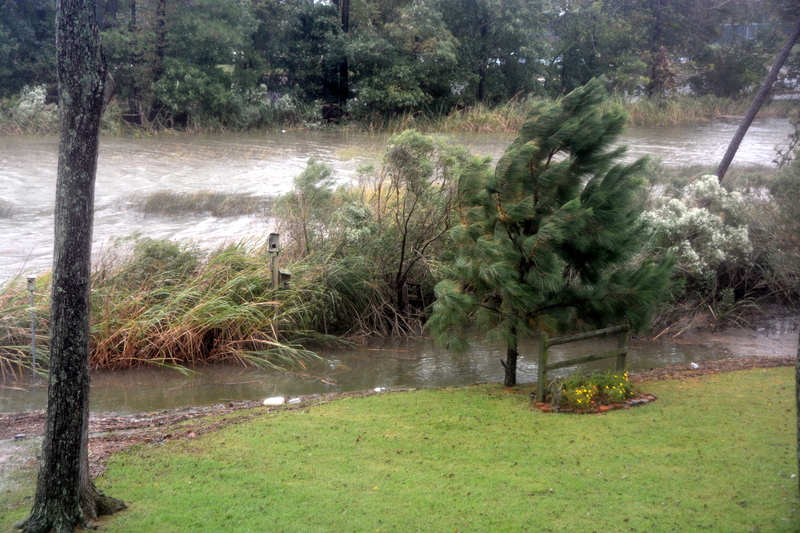 This shows our “front” yard, the side facing the river. I took this a few years ago during morning’s golden hour. And yesterday, when there was no golden hour. During a break from the rain yesterday, I took this little video of the waves “crashing” in our yard. 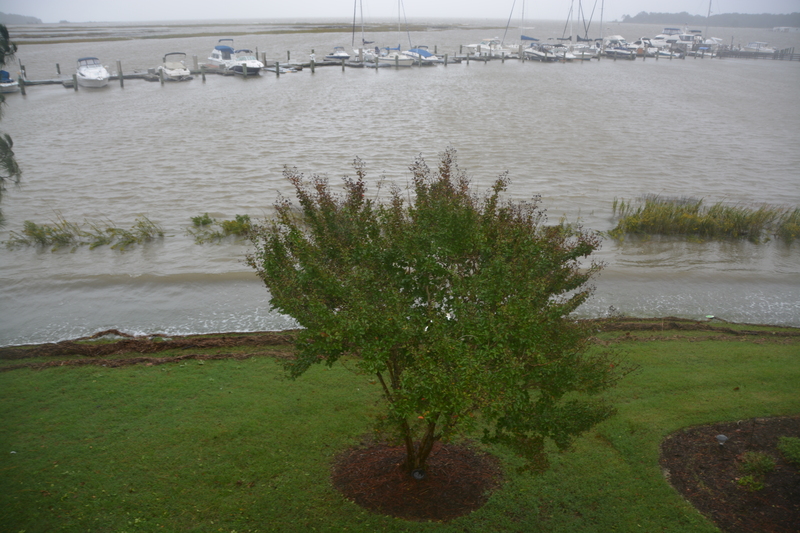 This morning, once again, we have wind and rain, and the forecast is for minor flooding during the next two tide cycles. And we’re hoping to see the sun by Wednesday. Again, we are so thankful the hurricane didn’t actually come ashore anywhere in the U.S. We’ll be thinking of our neighbors to the south as they recover from the devastation from this storm. 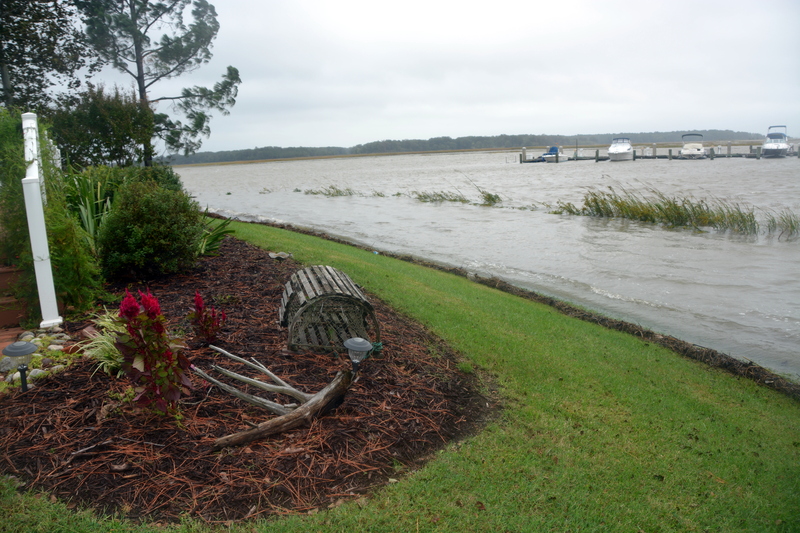 This entry was posted in Days at Home and tagged flooding from hurricane joaquin, pagan river flooding. Bookmark the permalink. The water damage and flooding that I am seeing on the news this morning is really something. We had a lot of extra water in the back yard as well but it has pretty much gone away. The hubby made it to Atlanta safely yesterday and that was what we were concerned about. Looks like more rain today in SC but we seem to be on the downward spiral of this yucky stuff. Stay safe, my friend. Been thinking of you, what with the flooding going on. Glad it is staying far enough from the house that there won’t be damage there. Take care and we’re all praying for sunny days again. Terrible, but I can see why you also consider yourself lucky. Great before and after photos. I guess this is the price we pay for wanting to live by the water. I know that when we were house hunting we rejected one house because it was on the river side of the road and I was concerned about flooding as we didn’t know the area. Since then I have seen water up to the back fence of that property a few times so I think we made the right choice to buy a house on the high side of the road. Prayers for all in South Carolina – they’ve really been hit hard. Praise that our situation was not worse. Great before and after pictures to ‘put a face’ on the flooding. Looking forward to the SUN so much!! I think I’ve begun to mildew – my spirit sure has. Great photos. We had the same thing. We have family in Columbia, SC and they are going through a lot. Now no drinking water. I’m happy to know you’re safe, Dianne. The poor people in Charleston and Columbia, SC, have really been hit hard. Amazing images and heartbreaking stories from SC ..
Love the contrast in your pics.. really puts it in perspective. I remember how bad it was during Isabel. Hard to believe that was over 11 years ago now …..
Wow. What an adventure you are having. I know the next sunrise or sunset picture you get to take will hold a special place in your heart as it will be a sigh of relief from all of this rain. So glad that you are safe. Great before and after pictures. Looks like all is well in both my neighborhoods. No water under our house in KH! I noticed the little pine tree we planted at your fence is growing up!! Nice comparison of the before and after pics, Dianna. So glad the storm did not do any more damage to your place. It is very heart breaking to see the pictures in SC, VA, and NC. They will have a lot of work to do in the future. God bless them all. It’s good to hear that you only had “nuisance” flooding. You were very fortunate. I enjoyed the before and after photos. Your before and after pictures sure give us a comparison. I can’t believe the 3rd and 4th pictures at the marina! Glad the “little old boat” is okay. Hope today is a better day! Glad to hear you were spared from worse flooding like those in South Carolina. My heart just aches for them. Great before-and-after pics, Dianna. That’s a lot of extra water. Glad it was just a nuisance. We can live with those every so often.